After a couple weeks of being off, I started to notice something peculiar. Mainly that I...wasn't hungry? I've never understood certain things about normal people, like how they get full on what seems like such little food, how they get to the point where they can't finish a couple of bites of food, and how they can go out to dinner on a Friday night and not dissolve into a ball of upset and sadness when told that they have to wait an hour for a table alone. I mean, I spend a great percentage of my life thinking about my next meal. On Tuesdays, when I work 11-5 without a break, I get scared, because I'm not sure when I'm going to be able to eat lunch. I don't like not knowing when my next meal is coming. However, after a few weeks of not really exercising and catching up on the junk I'd been denying myself most of the season, I suddenly started to get it. I'd get to a meal time, and I'd realize that I wasn't really interested in food. Huh? What? But, thankfully, as soon as I started training again, this feeling became short-lived. Within a few days, I found myself having to hold myself away from the fridge. At 5pm on Thursday, when I was within 1.5 hours of dinner, I still found myself digging around in the work fridge, just praying that I'd have an emergency apple in there. I did. The world could continue to revolve around its axis. Earlier today, I told myself that if I managed to finish out a miserable 4 hours on the bike, that we could get some Great Northern Pizza Kitchen on the way home, because darn it, we haven't had it in a long time, and I'm already down one of the extra pounds that I was supposed to gain (As an aside, the gain wasn't hard. At all). We split a piece in the car on the way home, because we couldn't make it the 15 minutes back to the house. Ahhh. Normalcy. On my first day of training, Monday, I swam, biked, and lifted some anemic weights for the first time in ages. On Tuesday, my legs were crying. Both of my bosses and a couple of our receptionists commented on my waddle walk. Darn it! I couldn't even hide it for a day! 3. I've crouched down at least once, and contemplated staying there because A. the quad stretch felt awesome and B. generating the muscle power to stand back up sounded hard. This generally happens under two circumstances at work-crouching down to adjust the stop on one of our machines, the Wall Crawler, and when getting iontophoresis pads out from underneath the sink. It just feels SO good to sit there for a second, until my calves start burning when I try not to fall backwards. Luckily, by now I've figured out that I can grab the bars on the wall crawler to pull myself up, and I use the cabinet doors near the sink to assist my return to standing. Self-explanatory. I had an hour of computer work to do at work on Thursday. It was one heck of a struggle. 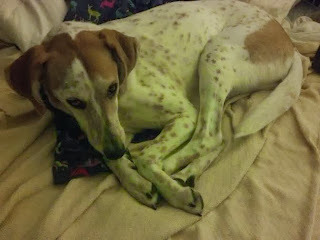 Keeping my eyes open requires a LOT of work sometimes. 5. Shower recovery beverage has happened. What's a girl to do when she finishes her workout at 12:45 and then immediately has to get into the shower to get ready for work? Why, mix up a tall glass of Endurox and bring it upstairs to the shower, of course. 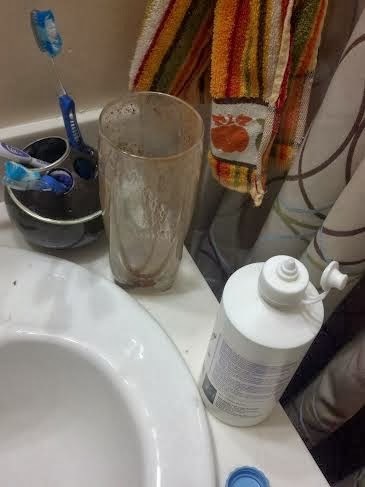 Nothing adds to the bathroom decor like a nasty glass with chocolate powdery residue, after all. Contact solution, toothbrush holder, Endurox glass. Makes perfect sense to me. 6. I've stopped giving a flying crap about matching my socks. Seriously. As long as both feet have socks on them, I'm good. 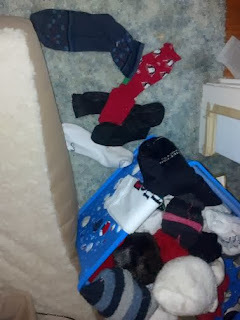 I hate you, socks. I don't have the mental power to play freaking memory matching you anymore. 7. Really small things start qualifying as legitimate entertainment. When training, I sort of exist in a lower level of consciousness, so it takes less to make me happy. One of the highlights of my week is always taking the Irondequoit Bay outlet bridge home on Friday evenings after work. It's as close to a social outing as I get on Fridays, and I weirdly enjoy the alternate route. Other things that entertain me when training are searching for new music on Amazon, checking the hourly forecast before I run, and looking at pictures of dogs on facebook (however, on the flip side, any sort of video of some sort of emotional dog thing makes me all overly teary). Doesn't take much. 8. Someone's got a case of the dropsies. With training comes an extreme lack of coordination. I'm not coordinated on a good day. Add in fatigue and slow reaction times, and it gets even worse. I've already started to drop my stupid pen repeatedly at work. Yesterday, I sliced my thumb open cutting up a beet. Then, I went upstairs, ironed my clothes for work, and then tripped over the iron cord when I went to turn off the closet light. The still on iron teetered precariously on the ironing board as I looked at it in horror, imagining the burns I was about to sustain. Somehow, I managed to react just in time as the iron crashed to the floor, mere inches from where my foot had last been. Perfect. Ahhh, brain fog. On the bright side, time seems to pass more quickly, because I begin to hone in on the ability to create a time warp that comes SO in handy on long trainer rides. My commute just sort of happens some days. When I wasn't training, I probably spent a lot of time telling people crap about myself that they didn't care about at work and talking about the weather just for the sake of talking about something. When training, I'm more than happy to sit there in a semi-conscious happy little state when conversation reaches a natural end. I've already found myself staring at charts and screens, not really thinking about anything, just staring. Earth to Jennie...earth to Jennie... And if I don't write something down on a post-it or text it to myself...it doesn't happen. The portrait of brain fog-it's debatable who's more blank, Jennie after a long, hard workout, or the Bailey. 10. 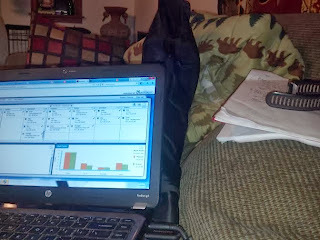 My couch has disintegrated into a pile of garmins, ANT+ agents, USB cords, newspapers, coaching notes, and Normatecs. I refer to it as my home office. It's so comfy, though. Going to watch some webinars now...living the high life! I have to say, though, all of these things make me feel normal, and when I feel normal (i.e. my entire body hurts a bit), I'm happy. My life without training was ok, but it really made me realize how much I love the life that's chosen me. A new backsplash is nice, but I get more pleasure out of finishing a long ride than I do out of looking at the area between my kitchen counter and the cabinets. I'm certainly looking forward to the upcoming season, and all that it brings! Hope the training goes well for you, and can't wait to see what this season brings!